Using genetic methods, Senckenberg scientists have discovered that there are more species and genetic lineages of the Chinese softshell turtles Pelodiscus than previously assumed. These turtles are an important food source in Asia – in China alone, more than 340,000 tons are grown and eaten every year. In their study, recently published in the scientific journal The Science of Nature, the international team shows that this cultivation, in particular, threatens the species diversity of Pelodiscus. In China, softshell turtles are standard fare in the traditional cuisine, and they are cultivated in large farms – 340,000 tons of turtles are produced annually, and live softshell turtles are on sale in every supermarket, packaged in plastic nets. "Normally, one would assume that the large number of commercially produced softshell turtles guarantees that this species is not threatened, despite its intensive use," muses Prof. Dr. Uwe Fritz of the Museum for Zoology at the Senckenberg Natural History Collections in Dresden. However, a study by an international team of authors around Fritz and other Senckenberg scientists, recently published in the journal The Science of Nature, reveals that this commercial production actually threatens the diversity of the Chinese softshell turtles. As demonstrated by the authors, there is not just "one" Chinese softshell turtle, but many different species. "Several genetic lineages, which in part are considered separate species, were already known to us, but we were now also able to genetically characterize four new lineages for the first time," explains Fritz. To this end, the team analyzed about 150 softshell turtles, both wild and farm-bred animals, using different genetic methods. The results show that some of the lineages definitely constitute different species, since their ranges overlap in in the wild without any interbreeding. In the commercial farms, on the other hand, the lineages are haphazardly thrown together, and the authors discovered genetic evidence that different species were crossed with each other. Moreover, the team of authors assumes that some farm animals escape back into the wild. In the Chinese Zhejiang province, they were able to document the simultaneous presence of five genetic lineages in one area that comprised at least three separate species – one of which is originally native to southeastern Siberia, more than 1,200 kilometers away. 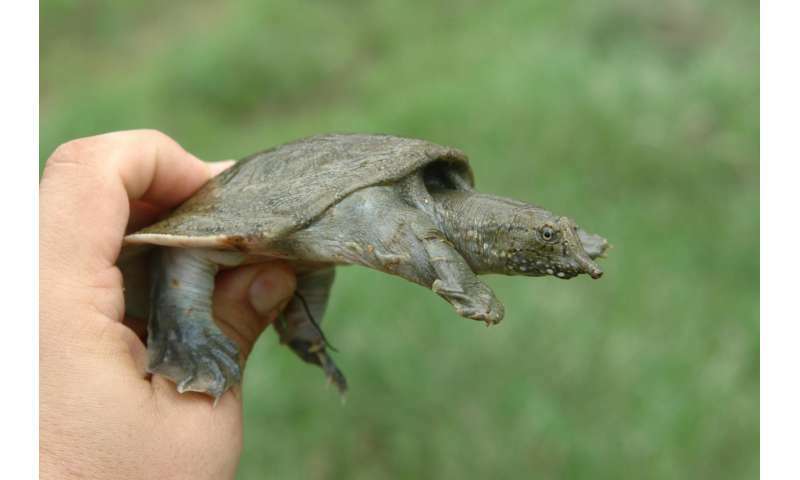 Fritz explains, "The intermixing of different species in the farms creates a 'standard turtle,' and there is reason to fear that the species richness of the Chinese softshell turtles will be lost completely. The escape of farm animals into the wild only hastens this process, since they interbreed with the wild populations." But there is hope: The study's lead author, Dr. Shiping Gong of the Guangdong Laboratory for Species Protection and Natural Resource Use points out that even today, many Chinese supermarkets already offer "bio-turtles" that are produced in accordance with organic-biological guidelines and sold at a much higher price than regular softshell turtles. He sees this as an opportunity for the preservation of the turtles' diversity. "If we succeed to convince our Chinese turtle consumers that "pure-bred" turtles are something special, then we hope that they are willing to pay a little more for these armored creatures. This would make the breeding of species- and lineage-pure farm turtles a profitable endeavor. I am confident that we would then be able to preserve the large diversity of the currently eleven different species and lineages of the Chinese softshell turtles. This could be a successful example of species conservation through exploitation."